The second edition of Tubądzin Design Awards (TDA) – international contest dedicated to students, architects and interior designers. It lasts until 31 July 2018. Ist stage 30.10.2017 r. – 31.01.2018 r.
IInd stage 01.02.2018 r. – 30.04.2018 r.
IIIrd stage 01.05.2018 r. – 31.07.2018 r.
Why should you participate in TDA? TDA encourage the best quality and the unconventional solutions in design. TDA promote the best projects and its authors on their websites. workshops with one of the best european designers at DOROTA KOZIARA STUDIO in Milan, at Villa International Co. in Budapest and at WWAA in Warsaw. 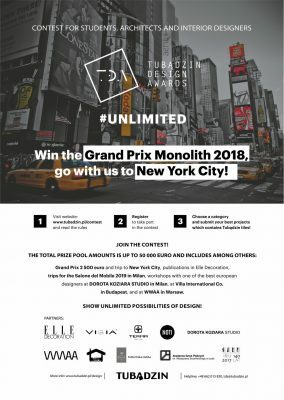 To take part in the design contest register at www.tubadzin.pl/design and submit a minimum of one project, in at least one of the stages of the architecture contest. Dorota Koziara (chair of the jury), Boris Kudlička, Małgorzata Szczepańska, Maciej Mańkowski and Tomek Smus. More info about the architectural contest and regulations on the website.